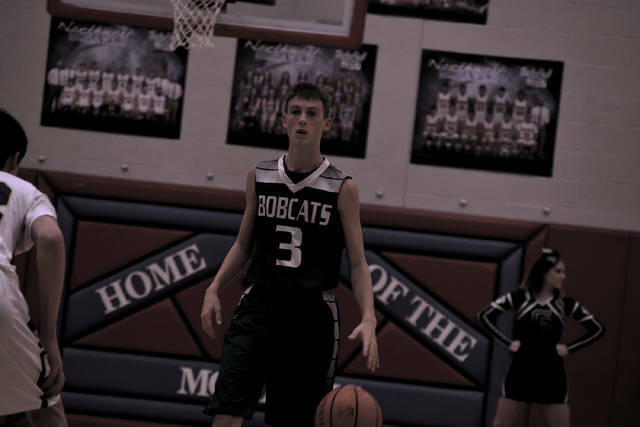 Green’s Tayte Carver looks for an open teammate on Wednesday evening. Green’s Dirk Hollar pumps his right fist in the air after the Bobcats took down Ironton St. Joseph, 60-56, to claim the school’s first Division IV Sectional Championship in 13 years. 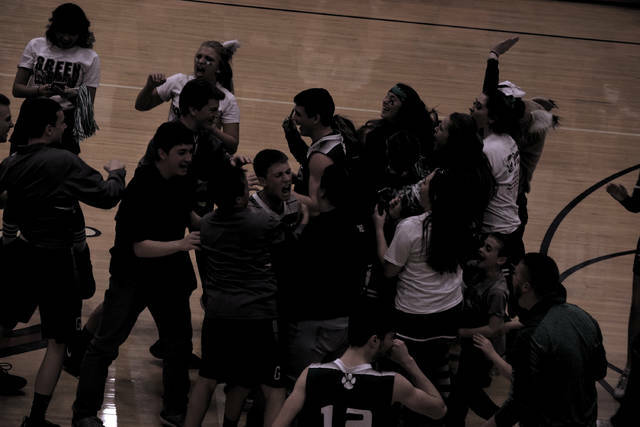 The Green Bobcats are joined by the student section in the ensuing celebration after the final buzzer. MCDERMOTT — Most of the time, 13 is usually thought of as an unlucky number. 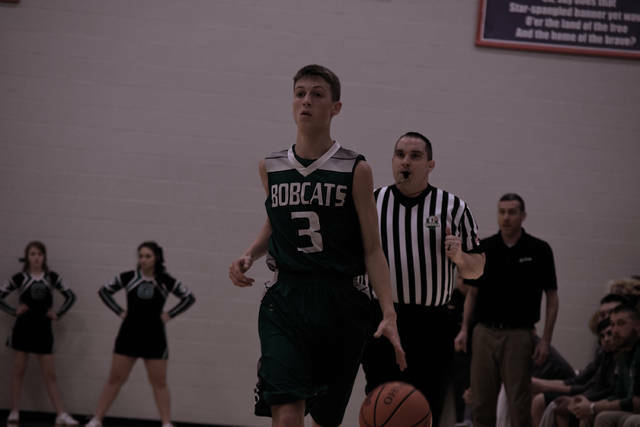 But for the Green Bobcats’ boys basketball program, 13 was a lucky count for Dirk Hollar’s club on Wednesday evening. Back in 2005, George Bush was still the President of the United States. Mariah Carey’s “We Belong Together” was the No. 1 song that year. And what about iPhones, iPads, or 4K TV? Yep, didn’t exist at that time. 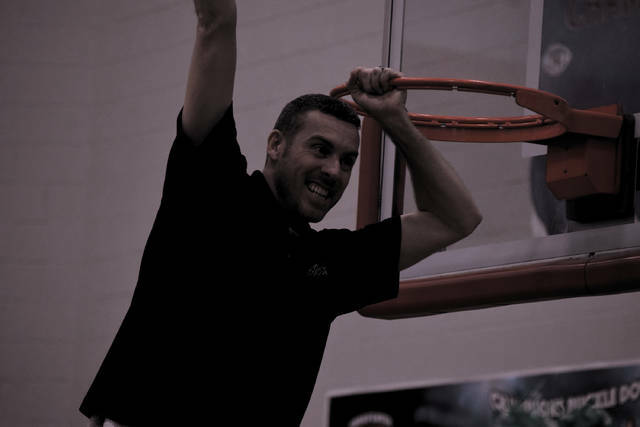 That year — the 2004-05 season — was the last time that the Green Bobcats advanced to the Ohio University Convocation Center in Athens, before Wednesday evening. At 9:45 p.m. that evening, that, however, became no more. Behind a game-high 17 points from Tanner Kimbler, several excellent defensive plays from Kimbler, Rylee Maynard, and Tayte Carver, and a committed effort in attacking the rim, Green was able to turn 13 years of frustration into a huge victory over the Ironton St. Joseph Flyers’ boys basketball program as the Bobcats stormed back from a nine-point third-quarter deficit by using its excellent defensive pressure to turn the 35-26 deficit into a 45-40 lead at the end of the quarter behind a 19-5 push. The Bobcats, who ultimately developed a 56-46 lead in the final quarter of action, then staved off a furious rally from the Flyers to claim the school’s biggest victory in the sport in the last decade — and set off an appropriate court-storming from the Green student section at the game’s conclusion — on the campus of Northwest High School in McDermott. For Hollar — who led the celebration by sprinting full-speed out on the floor — the first person that he wanted to hug was an obvious one. Throughout the opening quarter of action, both teams wasted no time trading counter punches as both units ultimately traded the point seven times during the opening eight minutes while battling to five additional ties. However, despite a 6-0 push by Green — which came off of a pair of three-pointers by Kimbler and Caden Blizzard — St. Joseph, who answered on the next possession behind a three-pointer from Joey McDavid, ultimately went on a 10-2 push to take a 19-14 advantage before ending the quarter ahead by the same margin (21-16). In the second quarter of play, both units struggled to score as the combination of shots falling in and out of the rim from the outside, along with referees holding their whistles and letting the players decide the outcome, forced both teams to work harder for their points. The Flyers, however, ultimately maintained the lead at halftime behind the play of McDavid, who was tremendous on both ends of the floor as the senior’s 12 points led all comers at the intermission. The 6-3 forward’s pickpocket of a Kimbler hesitation move, along with his layup on the opposite end of the floor, allowed Ironton St. Joseph to take its largest lead of the first half (32-24) before Blizzard’s basket from the left baseline cut the lead to a 32-26 margin at the break. When Zach Roach nailed the first of his three second-half treys to begin the third quarter of play, it looked like deja vu was set to greet Green all over again. But to the Bobcats’ credit, Green never deviated from attacking the rim and never showed the body language that would spell defeat, even when 50-50 calls didn’t go their way. After Blizzard — who put together one of his best efforts of the entire season during the affair en route to a 14 point outing — drew contact and got to the free throw line to cut the lead back down to a 35-28 count — Kimbler, Carver, and Maynard proceeded to take the game over on both ends of the floor. 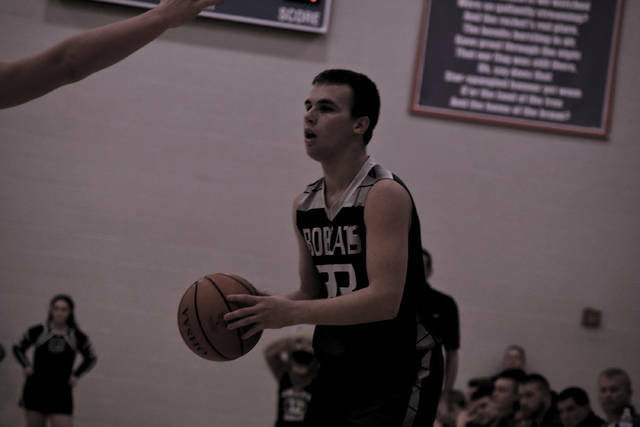 Kimbler converted his own steal into a three-pointer from the right wing, and Carver used his own takeaway to draw contact in transition en route to obtaining a pair of free throws. Excellent passing on a third consecutive takeaway then resulted in Zach Huffman getting more involved as the freshman finished down low to take the score on a blistering 9-0 run. When Roach answered with his second three, Kimbler proceeded to take his game to an even higher level than the junior already had been. The guard finished a layup through contact to answer the three-ball and proceeded to drive inside again to draw a foul and nail a pair of free throws to give the Bobcats their first lead of the second half at 41-40. Maynard, who then intercepted two consecutive passes on Ironton St. Joseph possessions, opened up an opportunity for Gage Sampson, who scored on additional nifty passing from Green. 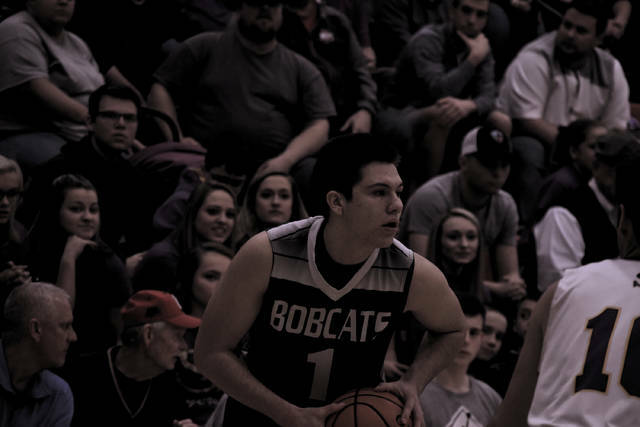 Maynard then took a pass on the right wing, drove inside, hop-stepped to the low block, and scored himself to cap off the game-changing 19-5 run that gave the Bobcats a 45-40 lead at the end of the frame. Kimbler, however, wasn’t done showing off his complete floor game. After Jimmy Mahlmeister scored on a mid-range jumper, Blizzard battled inside for a bucket to push the Green advantage back up to five points. Then, off of a St. Joe shot attempt that clanged off of the rim, Kimbler found Huffman with an outstanding no-look pass from the middle of the floor to the left block, which was appropriately finished by the latter. Carver then followed by going a critical 3-of-3 from the charity stripe — the last free throw coming on a critical and-one finish with 1:49 to play in the contest — to bump the lead up to a 56-46 margin. Behind threes from Mahlmeister and Roach, however, Ironton St. Joseph didn’t throw in the towel. In a matter of a minute and 15 seconds, the Flyers immediately stormed back to cut the lead to just two as the pair’s treys, along with a Chase Walters bucket inside, cut the Bobcats’ lead to 56-54. But when the Flyers anticipated a pass on the near baseline, Carver snookered the defense one final time, and made St. Joe pay as a result. His layup with 30.3 seconds to play put Green up by a 58-54 tally and allowed the Bobcats to ice the game from there on out. With the victory, Green improved to 13-8 overall — and more importantly, clinched an opportunity to play at the very place that it has wanted to get back to for so long. While its matchup against No. 1 Trimble — a 71-58 victor over South Gallia — won’t be easy, Hollar says that there’s nothing to lose as far as its 5:30 p.m. matchup against the Tomcats on Sunday evening in Athens. But for now, it’s time to celebrate in Franklin Furnace.